Day 9. Sat 28 July 2018. Flinders Ranges to Adelaide Day 10. Sun 29 July 2018. Depart Adelaide. Day 1. Friday 20 July 2018. Arrive Adelaide and private tour of the South Australian Museum. After meeting up at the hotel at 2pm, we walked down Adelaide’s boulevard: North Terrace, to the South Australian Museum to meet with geologist/palaeontologist Ben McHenry. Ben took us on a guided tour of the museum, which included a visit to the mineral and Ediacaran collections and a behind-the-scenes tour of the geology collection. We were able to see one of the most pure opal specimens ever found: The ‘’Virgin Rainbow’ an Opalised Belemnite ‘Virgin Rainbow’ (internal structural rod of an extinct squid-like marine animal) which has been valued at $1 million. We were also lucky enough to view and hold a meteorite which was cone shaped by its entry into the earth’s atmosphere, and a rock that was as old as the earth itself: 4.5 billion years! We were also able to hold some meteorites that have been identified as originating on Mars. A fascinating and informative afternoon. We then returned to the hotel for our welcome dinner. Day 2. Saturday 21 July 2018. Adelaide-Port Augusta-Kimba. After departing Adelaide we visited the Adelaide International Bird Sanctuary at two locations: St Kilda and Port Gawler. Here we observed a wide variety of shorebirds and waterfowl including Banded Stilts, Black-tailed Native-hens, Royal Spoonbill. Following the coast north, we had good views of a dozen or more Slender-billed Thornbills, a Fairy Tern and a small flock of overwintering White-fronted Terns. At Port Augusta we had a scrumptious lunch at the beautiful Arid Lands Botanical Gardens, where an array of native flowers and shrubs were host to a variety of Honeyeaters, White-winged Fairy-wren and White-browed Babblers. At the end of the day we explored the Bluebush plains where we had good views of Redthroat, Southern Whiteface, White-fronted Chats before we arrived at the township of Kimba on the eastern edge of the Eyre Peninsula. Day 3. Sunday 22 July 2018. Lake Gilles Conservation Park – Gawler Ranges. This morning we explored Lake Gilles Conservation Park, a mixture of ‘mallee’ eucalypt scrub and open woodland where we saw Western Yellow Robin and Rufous Treecreeper, both of which reach their eastern-most distribution here. Later in the day we visited the amazing Pildappa Rock, a worthy competitor to WA’s wave rock, before entering the rugged Gawler Ranges. The scenic park provided us with good birds such as Crested Bellbird, Shy Heathwren and White-eared Honeyeater while at the unique “organ pipes” we were lucky enough to obtain great vies of a rare Yellow-footed Rock-wallaby. Exploring the various habitats of the park, we counted over 300 West Grey Kangaroos, as well as a few Red Kangaroos and Euros, while a highlight was no doubt a Southern Hairy-nosed Wombat. Day 4. Monday 23 July 2018. Mount Ive Station to Coober Pedy. This morning we explored the habitats around Mt Ive, where we saw Redthroats, 3 Horsfield’s Bronze-cuckoos and both Splendid Southern Hairy-nosed Wombat. We then set off on a journey across the outback through an ancient landscape of spectacular scenery, exploring little-used bush tracks along the edge of the stunning Lake Gairdner. As dark clouds started rolling in, we were treated to spectacular vistas of South Australia’s vast outback salt lakes, complete with a rainbow, and then the rain came down heavily. The stark beauty of the landscape – expanses of salt lakes, white sand dunes, gnarly old trees, and seemingly endless gibber plains was full of contrasts and offered great photographic opportunities. We photographed the Pondanna ruins and homesteads part of which was constructed in 1880, fields of native yellow daisies (Senecio sp), and Red Kangaroos, while birds we saw included Southern Whiteface, Cinnamon Quail-thrush, Hooded and Red-capped Robins. At the end of the day we finally emerged from this remote area onto the Stuart Highway, which cuts through the centre of Australia, linking the south coast (Adelaide) with the north coast (Darwin) to reach our destination for the night in the opal-mining town of Coober Pedy. Day 5. Tuesday 24 July 2018. Coober Pedy. The morning hours were spent search for the endemic and elusive Chestnut-breasted Whiteface, of which we were lucky enough to see at least 10, providing great photographic opportunities. We then made for the Moon Plain, the desert-like moonscape with its fossilised shells, grey, soft clay dirt and cracks that appear to be bottomless, where a very obliging Gibberbird showed well. This was followed by Breakaways Reserve just north of Coober Pedy, a lovely reserve of colourful hills that have separated from the adjacent range, hence “The Breakaways”. We stopped at two lookout points that highlighted the open spaces and colourful environment, leaving an impression of the long-gone inland sea that our early explorers dreamt of. We also passed the Dingo Fence, a 2m high and 5,300km long wire barrier that stretches across three states to protect sheep farms to the south from our native dog, the Dingo. After lunch at a scenic lookout overlooking the “Two Dogs” we then visited a local opal miner and tried our hand at fossicking for the elusive gemstone. An Orange Chat turned up to observe the proceedings. Day 6. Wednesday 25 July 2018. Coober Pedy to Marree with Lake Eyre flight. Today we had an early morning departure to travel to William Creek for our scenic flight over Lake Eyre, Australia’s largest salt-lake at an altitude of -15 m. The one-hour flight provided a different, humbling and amazing perspective of the vastness of the outback landscape. Lake Eyre was about 40% full of water from rain that fell many months ago as far away as outback Queensland. From William Creek we travelled down one of Australia’s famous outback tracks, the Oodnadatta Track. It follows an ancient trail used by Aborigines for ochre trading for thousands of years. Artesian mound springs supply water in this arid region. Aborigines relied on this water source, so too did the European explorers who used the route to build the Overland Telegraph and the Old Ghan railway lines in the late 19th century. The track took us through true Outback country: gibber (wind-eroded stones) plains, rocky hills, and mound springs. Birds we saw included flocks of Zebra Finches, a beautifully posing Spotted Harrier, White-necked Herons and Red-necked Avocets at one of the rare waterholes in the area. We visited one of the famous mound springs along the Track: the Bubbler, where we learned about the source of life-giving groundwater in this area – the Great Artesian Basin. We saw some wild camels as well as a travelling camel train on the Oodnadatta track. At the end of the day we arrived in sleepy Marree where we spent the night in a beautiful historic outback hotel. Day 7. Thursday 26 July 2018. Marree to Flinders Ranges. First thing in the Morning we birded the bluebush – gibber plains near Farina, where we marvelled over several trapdoor spiders’ holes, some occupied and some abandoned with their little doors lying ajar. After checking out the ghost town ruins of Farina, we marvelled at the impressive indigenous ochre pits near Lyndhurst. The afternoon was spent exploring the Ediacara Conservation Park where we had exclusive access on a private tour with our geologist Ben and National Parks ranger Alan. Here we saw many fossil imprints in rocks at the old Ediacara minefield, of soft-bodied creatures preserved in the 560 million-year old sea-floor sediments. These creatures were the first known multicellular animal life on Earth that predates the Cambrian. This diverse and exquisitely preserved community of ancient organisms kept us enthralled for quite some time, while the impressive surrounding landscape provided distant views of Lake Torrens. We then visited the township of Parachilna overlooking the Flinders Ranges, an impressive range of steep hills and soaring rock formations on the edge of Australia’s outback, where we reminisced on a great day over dinner in Wilpena. Day 8. Friday 27 July 2018. Flinders Ranges. Today we spent a full day today exploring the Flinders Ranges. With rugged mountain scenery, peaceful gorges and a huge array of wildlife and flora, the Flinders Ranges National Park is recognized as one of the finest landscapes in Australia. The centerpiece, Wilpena Pound, is a magnificent natural amphitheatre of mountains. 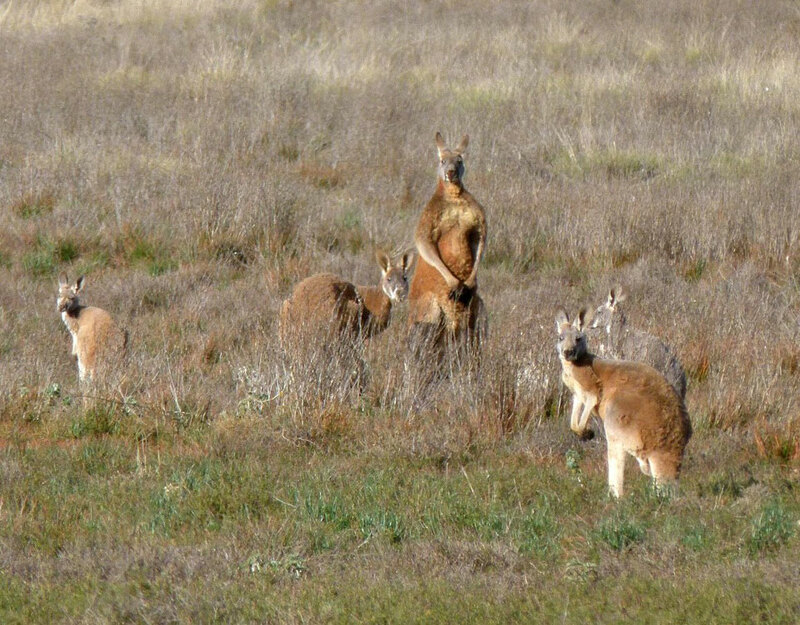 We saw dozens of macropods grazing the natural Callitris pine-lined grasslands including Euros, Red and Grey Roos, while Wedge-tailed Eagle soared over the grassy slopes. We explored the rocky Brachina and Bunyeroo gorges which traverse the ranges. The Brachina Geological Trail was of particular interest as it follows the gorge cut deeply through the ancient geological layers of the Ranges by the Brachina Creek. Geological highlights included an early Cambrian archaeocyatha (ancient sponge) reef; while we literally straddled the PreCambrian/Cambrian boundary and found further Ediacaran fossils in situ, including beautiful specimens of Dickinsonia, one of the more striking of the species present. Deeper inside the gorge we will saw remains of 640 million-year old glaciers and visited the Golden Spike – the place where the Ediacaran geological period was formally declared (the type locality of that geological event and the only one in the Southern Hemisphere. We also saw a 645 million-year old stromatolite reef (produced by the activity of ancient cyanobacteria) and observed the site where debris from a 580 million-year old Acraman meteor impact 280kms away near the Gawler Ranges became embedded in the sea-floor mud of the Bunyeroo Formation siltstones which are now exposed in this locality. We were also lucky enough to observe and photograph a colony of the endangered, beautiful Yellow-footed Rock-wallaby, while birds we encountered today included Grey-fronted Honeyeater, Australian Ringneck Parrot and Redthroat. At the end of the day we saw a Short-beaked Echidna before returning to our comfortable lodgings at Wilpena Pound Resort in the Flinders Ranges. Day 9. Saturday 28 July 2018. Flinders Ranges to Adelaide. A very early morning observation of a total lunar eclipse (blood moon) was followed by breakfast and departure to explore the area around Arkaroo Rock. The indigenous cave paintings here are a significant cultural site for the Adnyamathanha people of the Flinders Ranges and the walk took us to a rock shelter with paintings featuring ochre and charcoal images that depict the Yura Muda (Dreaming, or creation story) of Ikara (Wilpena Pound). There was also some great birding in the area, with 3 species of Honeyeater, a very obliging Southern Scrubrobin, Redthroats, Inland Thornbills and robins. From here, we left the Flinders Ranges and headed south through the scenic Clare Valley, a well-known wine region where, at this time of the year, the lush green pastures and flowering wattles made for a very scenic landscape. We had lunch at a scenically located historic homestead with some of Tonia’s friends from past Outback travel days and then returned to Adelaide for a final meal and reminisced on what a great tour it had been! Day 10. Sunday 29 July 2018. Depart Adelaide. Today we departed Adelaide for onward travels back home and further afield. This entry was posted in Outback Tour. Bookmark the permalink.